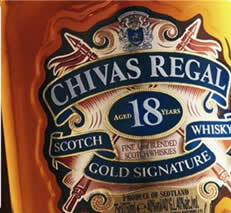 Chivas Regal Whisky – Chivas Regal 18 Year Old Gold Signature Blended Scotch Whisky 40% Alc/vol. It was several days ago when we received an e-mail from James Brown of Richmond Towers Communication Ltd., London and he asked if the Whisky Boys would be interested in doing a tasting of a Chivas Regal 18 year old blend. 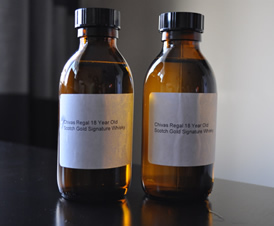 Well it took all of a micro second for us to reply saying we would love to and no sooner said and done than a parcel arrived containing two sample bottles of the 18 year old dram. So on Saturday night when Jim had invited Nicola and her family over for a little dinner party, they started the evening with a tasting of this Blended Scotch. There was no Dougie, he is still up in Aberdeenshire, working. But the Whisky Boys duty is to carry on tasting. Produced by Chivas Brothers (who are now owned by Pernod Ricard) this blended Scotch Whisky has it’s home and visitor centre at Strathisla Distillery up in Speyside. 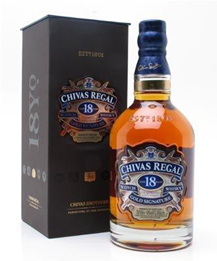 Chivas Regal 18 Year Old is the creation of the Master Blender, Colin Scott. Every cask of Whisky selected has been carefully chosen from very old and precious stocks aged for a minimum of 18 years, including some Whiskies that are now very very rare. We recommend that you check out their website www.chivas.com where you can gain all the information about Chivas and all their products, the Whisky Boys think it is a very good site and has all the info you will need. Nose…Vanilla, fresh and sweet, not too complex. Taste…Flavoursome and spicy, hot pepper, ultra smooth. Finish…I found this to be quite short. Nose…A lot of dried fruits, sweet spice and a hint of toffee. Taste…Sweet and slightly floral and a slice of Cadbury’s chocolate orange and a little woodiness, very mellow. Finish…Not too long, warming and leaves your taste buds with a little cuddle. This premium blended Scotch Whisky did not disappoint on flavour and taste. It is slightly more complex than the 12 year old Regal and far more smoother and mellow oh so easy to sip, dram after dram. This 18 year old blend is not too easy to find in your local supermarkets, but certainly available on the internet and all of your specialist Whisky shops. Jim has found himself in a little quandary, he really enjoyed this 18 year old, but it is priced at over £50 for a 70 cl bottle. 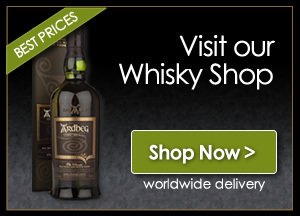 So does Jim buy the blend or purchase a more complex single malt like some of his favourite Bruichladdich’s, Ardbeg or a very good Speyside and probably have change from his £50. So the only down side we found with this wee dram was the price, we think that we would spend our £50 on a bottle of Chivas Regal 12 Year Old and say, a bottle of Laphroaig 10 Year Old. If you are a blend drinker then this is the one for you, there cannot be many blends that are as good as this one, and should be kept for a special occasion or a special dram after a fabulous meal. We have to give a BIG THANKS to James Brown of Richmond Towers Communications for sending us the sample bottle for us to enjoy and taste, looking forward to hearing from you in the near future. Respectfully, I disagree. I find that the price of this blend is to high for the quality of blended scotch. Johnnie Walker Gold, another 18 year old blend is more interesting and complex in terms of flavor profile. So too is Famous Grouse 18. Of course comparisons to single malts would not be fair normally but when you consider the fact that for the price of Chivas 18 you could buy a number of single malts that are better, it really brings home the fact that there is no value for money here. For example Glenfiddich 15 Solera is cheaper in price but far superior in flavor. Anyway, that’s just my opinion. Next story Master of Malt – It’s nice chatting with you….